Pope Francis hasn’t shied away from talking about his own mortality in recent months — and perhaps that’s the reason he’s increased his focus on young people over the past year. Much of what has driven this papacy has been an eye toward the future. In his encyclical “Laudato Si’,” Pope Francis asked the world to consider creation as a whole and tasks us to steward the environment in a way that not only serves our present circumstances, but that of future generations. In naming cardinals from remote regions of the world, he has redirected our focus to areas where the church is growing and thriving, and he’s invited the rest of the world to consider their example. So it should come as no surprise that Pope Francis is now concentrating on today’s youth — the constituency of the church that will be tomorrow’s future families, priests, religious men and women, and other members of the laity that will shape the church over the 21st century. Here at home in the United States, an honest assessment serves as a sobering reminder that there’s much work to be done. A 2016 study from the Public Religion Research Institute revealed that young Catholics are leaving the church at a faster pace than any other religious group in this country, and according to the Pew Foundation, the vast majority of Catholics who leave the church do so before the age of 23. While some may see this as cause for despair, Pope Francis is seizing this as an opportunity and inviting the worldwide church to do the same. A primary theme of this papacy has been creating a “culture of encounter” — one that is motivated by engagement and seeking understanding. That’s why the preparatory document for this synod concludes by posing questions attempting to better understand the plight of young people today. Young people from around the world have been asked to consider both practical questions (such as how the language of today’s world that’s used in sports, arts, music and other arenas can be integrated into the church’s outreach to young people) and pastoral ones (such as, “What does ‘spiritual fatherhood’ mean in places where a person grows without a father figure?”). For Pope Francis, the church must be guided by the concrete realities that affect the faithful. This was true for the previous synod on the family, and it will prove equally true for this synod on young people. It’s for this very reason that he so often uses the paradigm of accompaniment and the image of becoming neighbors and walking alongside those journeying in faith together. And just as neighbors and friends do in our everyday lives, the church will attempt to engage in the practical concerns of young people. The synod preparatory document, like the synod itself, will address matters of employment, immigration, sexual exploitation, drug trafficking and the growing tide of secularization that makes faith difficult. This is an approach that is rooted in an understanding of the importance of relationships and realizing that individuals must feel loved, known and cared for, before they can be challenged and changed. In his first major papal document, “Evangelii Gaudium,” (“The Joy of the Gospel”) the pope tasked all of us to become “joyful messengers of challenging proposals.” It’s a recognition that the demands of Christian life are great — but ultimately are the source of joy and salvation. It may seem countercultural to invite the youth of the world to re-evaluate their lives in light of the Gospel and consider a new way of living, but fortunately there’s precedent for that. Two thousand years ago when a ragtag gang of young fishermen were approached and asked to do the same, their consequential yes changed their lives and that of the world. 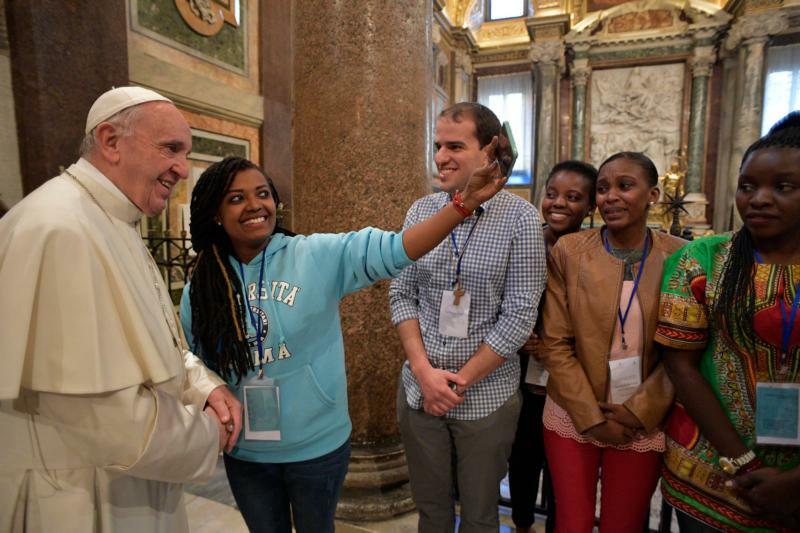 For a world that’s looking for hope and a new way of living, Pope Francis is hoping that this invitation to young people might just have a similar outcome. White is director of Catholic Voices USA and a columnist for Catholic News Service. NEXT: Young adult ministry: What works?